After the success had by the 650 S, McLaren has a new model designed and reserved especially for the Asian market, with demands growing in both China and India for cars from the British constructor. The new model, the 625 C, was revealed in Hong Kong Auto Show. It is based on the 650 S, has almost its same specifications, with a slight decrease in power, but has a more refined style. It will come in two versions, a coupe, and a spider. In fact, the 625 C, has the same 3.8L V8 engine in the MP4 and 650S, that produces 625p, or 616 bhp @7250 Rpm, and 610 Nm of torque @3000 to 7000 Rpm. 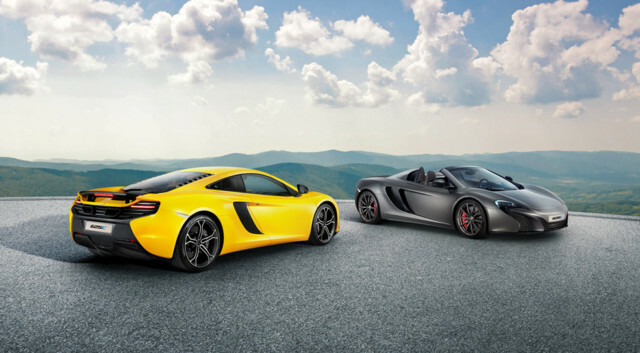 These are almost the same figures on the 650S, although, the 625C has 25 less PS. It goes from 0 to 100 in 3.1 seconds, 0.1 second slower than the 650S.0 to 200 takes 8.8 seconds, which is half a second slower. Quarter of a mile is achieved in 10.6 second with a speed of 136 mph. Top speed of the car is 333 kph for the coupe, and 329 for the spider. Both the cars will be fitted with 7-speed DSG gearbox. As you all noticed, the car has the same looks as the 650S, but has a new revised chassis, and engine. It has softer rear suspension. Now has a revised Pro Active Chassis Control system, revised mechanical balance, in order to fit the Asian structure of roads. In the inside, the car has some luxury features, such as navigation systems, satellite radio, Bluetooth, rear-view camera. It has also carbon-fiber racing seats, and carbon-fiber trim work. McLaren hasn’t put a price on it yet. The 625 C will be exclusively for Asian markets only, but it will be seen roaming European roads. It is set to compete with the Mighty Ferrari 458 Speciale. And in case you are wondering what does the C mean, it is for Club, to make it appealing even in name to younger generations.